One of the most rewarding ways to collect coins is finding rare coins right in regular circulating coinage from the bank. You just can't go wrong with searching bank wrapped rolls of coins! You buy the coins at face value, search them for errors, varieties, and rare coins, and then sell the rejects back to the bank to get more coins to examine! You only have to invest your time in using this risk-free methodology. But, it's not as easy as you think. However, even if you can get your local bank to special-order the wrapped coins unless they qualify as Commemorative Issues, there is no guarantee that the Fed will send the banks mint-state coins anyway! The Fed isn't required to honor requests for mint-state (what they call "new") coins, but they say they do when inventory levels allow. The Fed always sends out "mixed" (circulated or used) coinage first. The point here is that even if you found a bank willing to cooperate and order new coins for you, they might not get them! The result is that the bank fills out a Special Request form, possibly pays fees, and then didn't understand what you wanted anyway, resulting in unhappy customers. If it is an odd denomination, like a half dollar, the bank may be stuck with them for several months or years since very few customers asked for them. The banks' solution to this problem, typically, is to avoid doing any special ordering for coins at all. Finally, banks in smaller markets may not be ordering directly from the Federal Reserve Bank. The Fed may contract with a large regional bank to do their coin and paper money distribution into smaller markets. Since the bank is acting as a middleman, this increases the cost of handling the rolled coins. The large regional bank also collects a fee from the ordering bank for handling these special requests. Now that you understand the reasons why banks are reluctant to order and provide rolled coins, you can learn to work with them to get what you need, whether it's mint-state rolls of Sacagawea Dollars or heavily circulated pennies so you can sort out the copper from the zinc. The first step is to define your goal. If your goal is to get mint-state coins of non-commemorative coins (as defined above), your best bet is a smaller, full-service bank that doesn't usually deal with a lot of merchant accounts. Such banks are typically positioned as higher end "enterprise banks," and don't have the free types of checking and savings accounts. But if you're a hard-core coin searcher or like to lay up a lot of mint-state rolls, a bank of this sort will be the type most likely to order and get "new" coins. They will most probably pass the fees along to you, too, and having an account at the bank will be mandatory. If your goal is to buy rolls of circulated coins, your best bank type is the big name, broad appeal banks where average small business people do their banking. These banks typically deal in very large amounts of circulated coinage, as some types of businesses take in more coins than they need, and will deposit them. Other business types use vast amounts of mixed coinage to give to their customers in change. Banks that do a steady merchant business almost always have plenty of circulated coinage on hand, and will often sell it to non-account holders. If you want to get this type of coinage regularly, though, especially in large amounts (such as boxes of rolls, rather than just a few rolls themselves,), it's a good idea to open an account there. Regardless of the type of bank you go to, you may encounter tellers that are difficult, stubborn or obtuse. Some of them merely need some genuine hand-holding, but others seem to be contrary just because they can. When you encounter difficult tellers, take a moment to explain things. Tell them that they can order the coins directly from the Fed on your behalf. If they claim they can't do that, then asked to get the head teller or supervisor. Always be courteous but firm. If banks claim they "don't carry" the Presidential Dollars, for example, let them know that all they need to do is order them. Go up the management chain if you have to. If they keep insisting they won't order them, ask if there's another branch of the bank that will. Get them to call around for you to find what you need. After all, you're the customer! When you know a particular coin type is being released, call ahead and ask your bank to order the quantity you want, and hold it for you. 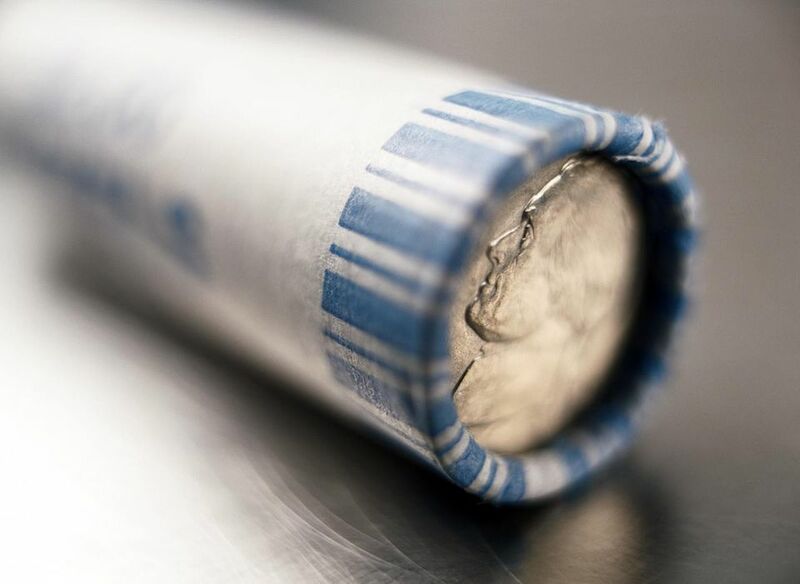 If you like to put away rolls of mint-state coins of types that are hard to find in full rolls, such as nickels and dimes, call your bank every couple of days and check to see if any mint rolls came in. Find out what day they usually get their Fed orders, and call that day. When they get some mint-state coins in, ask them to hold them for you. By far, the best way to ensure a steady supply of bank wrapped rolls is to develop a relationship with a certain bank. Become friendly with the head teller or manager. Ask them to call you if someone deposits unusual items, like rolls of half dollars or large size dollars, such as Eisenhower Dollars. In fact, make it a habit always of asking the teller to check the vault for rolls and partial rolls of these coin types. Banks would love to clear out these oddments since they can't send them to the Fed until they acquire a certain amount. Half dollars and large size dollars, among all types of currently circulating coins, are most likely to produce silver or valuable varieties! One of my juiciest sources of circulated coins is the company that services the Coinstar machines in my area. People dump all kinds of old coins into those things! Another great source is convenience store clerks. Sometimes people bring in whole rolls of wheat cents or silver coins to buy cigarettes and liquor. Develop a rapport with likely sources of great coins in your neighborhood, and let them know you collect! Pass out a business card and ask them to call you when interesting rolls show up. I get great coins this way!